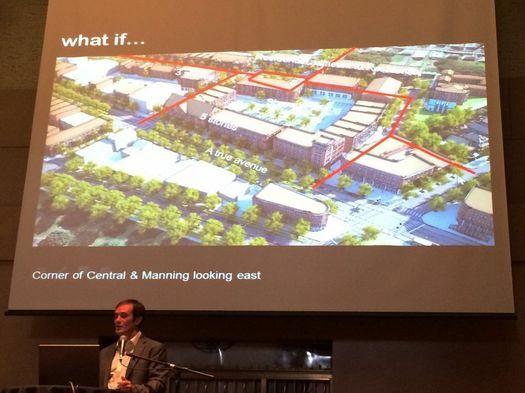 Jason King presenting some ideas for the Central Ave neighborhood at a ReZone Albany event at The Linda last summer. One of the most interesting parts of the ReZone Albany project has been the series of events focused on the futures of specific neighborhoods around the city. The last one, about the neighborhood around UAlbany's downtown campus, was just this past week. Here's a recap of the ideas that came out of that. These events have been interesting because they've been opportunity to hear what members of the public think about these neighborhoods right now -- what they hope for these neighborhoods in the future. Another interesting part of the series has been to hear the perspective of the consultants heading up the sessions. The reps from Dover, Kohl -- which is based in Miami -- have had a chance to get to know Albany over the past year. But they also bring a national perspective to what's going on here because they do similar projects all over the country. So after last week's event at UAlbany, we took a few minutes to talk with Jason King -- the firm's senior project director -- about how he sees things here in Albany. Some of the things he said we suspect will have you nodding your head. And we're guessing some of you will also hear some things with which you disagree. Here are a handful of quick clips from the interview. "The university is going to invest the $60 million in turning the Schuyler building, the high school, into the college of engineering. So that makes this one of the most of the most promising parts of the city." "The reality is, in terms of quality of life, in terms of the man-made environment, Albany offers a lot." "You're like Europe. I mean, really, the architecture is good enough, the street design and the park design is good enough to compare to Europe. But you're not Asia, which is just exploding and just like crazy population [growth]... It isn't bad being the Europe of the United States." "The mayor is very conscious of do a plan in one spot, make sure you do a plan in another. If you do an investment in one part of the city, make sure you do one in another." "I always invite family members of mine from Rhode Island, and they see Albany and they're like, wow, that's terrific, honestly ... They always have a good experience. So, how do you get the word out?" These are some really earth shattering revelations "Albany offers a lot"....."you're not Asia"......"the mayor is here"........do we tax payers really cough up our hard earned money for these people to come up from Miami to tell us this??? We really can't let even an interview with the person heading the Rezone efforts slide without deliberately obtuse whining? Perhaps moving would be in order if you find your life here so depressing? Back on Earth, it was really cool to hear the perspectives of someone who travels the country working on these issues. I keep hearing about how great life is in the booming south and west, but when you actually go to these places, they're almost entirely unbearable. We may have issues, but at least we have something solid to build on, and the opportunity to do things slowly and well. In the meantime, it's still a much, much better place than most. ReZone Albany is fantasy. Albany barely has enough to money to fill pot holes. The Tri-Cities always had a solid foundation to build on, the suburban to urban focus wheel just took a long time to turn. Now, isn't somebody going to mention burying 787, lack of river access, or Wegman's? Thanks for recording these comments. I agree with so much of what Jason said. Albany does have a lot to offer. The whiners are always going to be negative but I think it's because they lack a basic understanding of how much is on the City's plate and what few resources are available to do it and why that is - ahem urban disinvestment and suburban sprawl. There are so many good people doing good work in Albany, loving Albany, and I see that continuing. "the fix is in! where are the fresh ideas?! Albany has no ambition"
"we don't need anyone from..... telling us what to do!" Albany gets state grant funding to update zoning code that dates back to 1968, choking development and frustrating neighborhood advocates while surrounding communities prepare and update their codes. @Bill: I think skepticism of some of the future possibilities presented in the neighborhood-specific sessions is fair. Many of the potential projects presented would require large investments -- and taken all together, they'd require enormous investment. That said, I think the ideas are presented in large part as a way for people to talk about the sorts of things they'd like to see (or not see) in the future, and maybe set some goals about direction. And some of the ideas -- like a road diet for Washington Ave -- are not prohibitively expensive. And as for the main goal of the Rezone project -- the rewriting of the zoning and codes -- that's actually happening. And there's already an early result of that process: The mixed-use overlay district implemented for the Warehouse District has smoothed the way for the approval of new residential projects in that neighborhood. @Andrew Gregory: 787 was a big subject during the sessions focused on the South End. (Pretty much all the small work groups made up of members of the public were like, tear that thing down.) And I talked with Jason King about it back then -- his take, based on what's happened in other cities, was that it basically has to become someone's job to advocate for taking down a highway like 787, and there has to be a concerted effort to continuously push for it to happen. (Looking up notes...) "It takes a lot of effort and a focused initiative." I commend all over albany. because it is the only entity that attempts to distill the Re-Zone sessions and provide information for those who do not attend the sessions. The consultant hired for this effort has failed over and over again to make written information available before or after the sessions to general public for comment. The activity in which they are engaged has a very wide scope, and ranges from setbacks to re-configuring whole streets. But there is precious little readily information readily accessible.Documents on website are simply flyer PDFs,with almost no information or drafts of documents that exceed 250 pages, which can not be used stand alone, and require an understanding of existing zoning regulations. People cannot support what they do not understand. And so far no effort has been made to facilitate that understanding beyond meeting attendance. And many people do not attend those meetings for many reasons. And castigating those who don't serves no purpose. It would be great if more could be done to utilize the waterfront with zoning areas for the development of bars/restaurants/parks/common areas - 787 was poorly planned but isnt going away - I just hope that any remaining area accessible to the river can be a main focus in whatever parts of Albany, if any, ever do become revitalized. Also, can something finally be done about the eyesore of Albany's otherwise pretty nice skyline? Central warehouse I believe its called.. I liked the ideas that have been floated in recent years that talked about using the building as a giant canvas for art murals as opposed to tearing it down. I enjoyed listening to the planner's perspective. As an outsider who moved to Albany from an entirely different part of the country, I think Albany does have a lot to offer. Yes, some of the ideas seem far fetched, but 10 years ago who would have thought the warehouse district would have upscale housing, a soon to be opening food market, and high quality pubs and restaurants? As for the area around Washington Avenue next to the downtown U Albany campus, I wouldn't sneer at the potential for development there. Residents of the Washington Square neighborhood say that area has already improved dramatically compared to 15 years ago, and there has already been some development there with the renovation of the building that is now 27 Western Ave. I was in Seattle this past spring for a conference, and while the city is beautiful because of its natural setting, it lacks the charm of Albany's historic neighborhoods. Most of the downtown and area around it were simply modern gray boxes that could be in any city around the world. Traffic was an utter nightmare and a small, single family home costs around $800,000. We have it pretty good here in most respects. Greg, "diet for Washingon Ave is not prohibively expensive", the plans for the Madison Ave diet have been in the talking and planing stage for about 3 years. Let's see when and if this very medioker project get completed. Folk who said here come the cynics are people who haven't lived in Albany for many years. I have seen dozens and dozens of great plans and ideas if and small for our city come and go without action. That's not being a cynic it being real. Clint, while you're absolutely right that, like every other place, many plans come and go without action. That's why I keep pointing out that THIS IS NOT A PLAN. This is a revision of the zoning laws. The ideas in these renderings may come about, they may not. But this process is only to make them easier by changing the law. Just like future road diets will be made easier by the one on Madison. Ryan, one of the earlier zoning meetings focused on the South End and waterfront access. a) We CAN get rid of 787. Not easily, but it can and must be done. Other cities have gotten rid of waterfront highways. It's not free to maintain so, that maintenance money should be the seed cash to get rid of it. Imagine the boom of development when we have a whole bunch of (newly) waterfront property. b) We MUST have new political leadership. It's been 100 years of 'asleep at the wheel' in the city and county of Albany. The same old problems are talked about but there is no leadership. Citizen advocates can only do so much on their own. c) There has to be outside-the-city revenue for Albany City taxes are way too high and no one has a realistic plan for addressing that. Yet there are 70,000 people who come into Albany every day who contribute nothing to this city. They use up our resources and create their wealth....then they take it home. Let's be blunt here, they are freeloaders.